Elimination of the step-down transformer and its related losses. Lower cooling requirements, because less energy is being lost as heat. The National Electrical Manufacturers Association (NEMA) has approved two wiring-device configurations to support these installations, which previously were completed using pin-and-sleeve connectors. 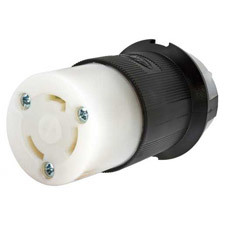 These two new twist-locking connector options, L25-30 and L26-30, incorporate features to ensure cord retention and protect terminations from cord and cable strain. And they incorporate shielding to protect wiring chambers from dust or other contaminants. “Now that we have the new NEMA configurations available, customers are leaning toward the new twist-lock design,” says Mike Williams, senior product manager with Hubbell Wiring Device-Kellems.